As part of an ongoing effort to share the stories of more soccer fans out there, Kristen Gehrke shares her tale of becoming a Timber's fan. If you have a story that you'd like to share, head over to the "Contribute" page. I was asked recently, probably after an especially raucous Timbers-related rant, how I came to soccer. I was never much of a sports fan. I followed Portland’s minor league hockey team through high school and have been known to go to Trailblazer games if someone offers me a free ticket, but that was about it. Then, a few years back, I started working at a hotel that had access to free tickets to the AAA baseball team in town at the time. I happily claimed some of them and spent quality summer hours sitting in the sun with a friend who was a White Sox fan and an expert heckler, drinking beer and eating nachos. It was never really about baseball so much as it was about the beer and nachos. Through my association with the aforementioned hotel, I also found myself with access to Timbers tickets. I’m ashamed to say I didn’t take advantage of them as I should have. But those hotel freebies did allow me my first memorable Timbers Army experience. It was the summer of 2007 and the hotel was hosting a national level beauty pageant. I know about as much about beauty pageants as I do about sports. But, there I was, in one of the suites at what was then PGE Park, surrounded by forty stunning – yet visibly bored - women wearing crowns and sashes. I’ve never felt so out of place in my entire life. Thankfully, I had managed to talk my White Sox fan friend into coming with me and even more luckily, his cousin was frontline with the Timbers Army. A quick phone call and our suite full of beauty queens was infiltrated by a contingent from the TA who chose to wear their trademark scarves as sashes. I’m still kicking myself that I didn’t have a camera. Now it’s four years later. I proudly wear the TA scarf. When I root, I root for the Timbers. And I’ve just renewed my season tickets. 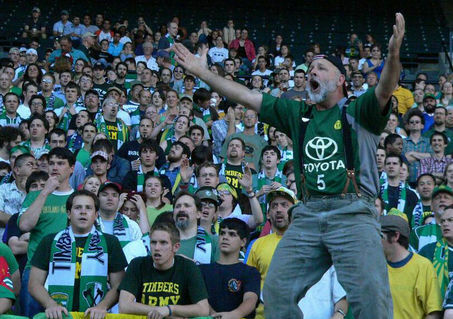 I came to soccer because of the Timbers Army. I stayed because of the unpredictability of the beautiful game.